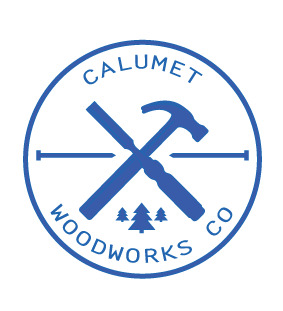 About Us — Calumet Woodworks Co.
Calumet Woodworks Co. is the continuation of a legacy in manufacturing and craftsmanship which began over 100 years ago. The original company, Calumet Steel Co., was founded in 1907 in the southwest suburbs of Chicago. Calumet produced steel bars and light shapes consumed by the agricultural, construction, and automobile industries. In early 2002, following the retirement of Chairman James Mertz, the plant assets were sold. Jim encouraged his grandson John to always work hard, have fun, and if you can, to be your own boss. Following the advice of his mentor, John began to learn the art of woodworking in his grandfather's garage shop. In 2012, John began where his grandfather had left off and started Calumet Woodworks Co.
Calumet Woodworks was founded as a custom woodshop producing high quality cabinetry and casework. Since our inception, we have continued to streamline our processes to provide exceptional cabinetry at competitive prices. One of the most recent additions to our shop is DorrLove. This new system uses our handcrafted, solid wood doors and your existing cabinetry or Ikea cases to achieve a fully custom look at a fraction of the cost. Under general supervision of designated supervisor, to fabricate and prepare for finishing various wood cabinets, doors and fixtures for field installations. Cut, shape, and assemble wood with shop tools and equipment such as planers, jointers, shaper, routers, sanders, and various power saws. Assemble prepared components for various structures, including built-ins, tables, cabinets, and paneled doors.